A school mission statement that expresses the purpose, values and vision of a school in a few compelling words can have a powerful impact on the school change process. In order to remain relevant and meaningful to the school community, the mission should be developed through an inclusive process in which all constituencies have a voice. The mission process itself is as important as the final product in that it serves as a way for the community to crystallize the the school’s central purpose. But in order for the mission to become meaningful to a community, it must first be firmly rooted in the culture of the school. Therefor it must be nurtured and attended to as a living statement reflecting the purpose and aspirations of the school community. 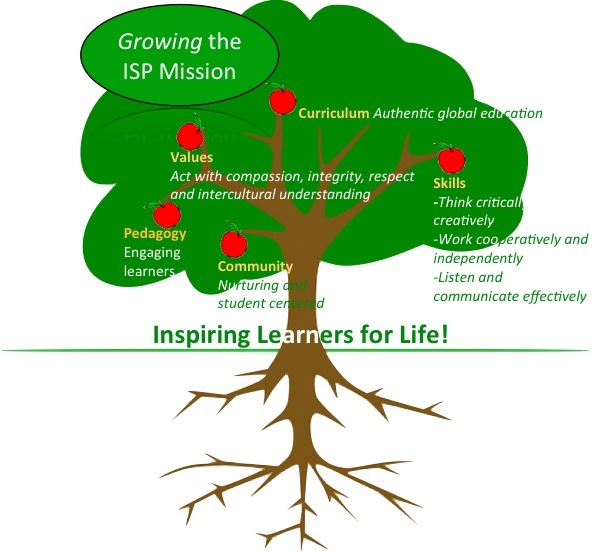 Over the past few years our school mission has taken root and is beginning to flourish in many areas, such as in curriculum (authentic global education), pedagogy (engaging diverse learners) and values (acting with compassion, respect, integrity and intercultural understanding). What are the implications to our practice? What are potential implications to the school? What are the barriers to innovation at ISP? We view this as a first step in the process of forming “focus groups” or “action research” groups, who will eventually advance ways for the school to improve and innovate. In order to escape the fate of becoming curious artifacts of 20th century education, schools around the world are addressing the sometimes daunting challenge of profound systemic change. While a revolution in how schools function in the twenty first century is inevitable, dare I use the tag line from the new movie Rise of the Planet of the Apes, “Evolution becomes Revolution.” The challenge of school change is to create a path which honors the current structures while simultaneously and profoundly changing them. But I’ll leave that to another installment. Thank you for sharing . In your post you share that “create a path which honors the current structures while simultaneously and profoundly changing them”, I wonder if one can create a significant change or revolution based on honoring our current structures of the industrial age mode of education which is out of sink with the world. I think the bigger challenge schools and educational institutions face is how to completely reinvent themselves. To often when you try to create something new based on older forms/structures you quickly limit your options as you are confined by these. We need a completely fresh start, a clean slate, and give ourselves permission to not think within the box or outside of a box of our current structures, but just get rid of the box altogether. I think all educational institutions are facing a growing reality how can we be a significant player in learning in this globally networked world . There is no doubt fear, skepticism and cynicism associated with the idea of completely revamping from scratch. This is understandable when we are talking about a system which has been in place for over a 120 years. Our future is an unknown and maybe as educational leaders we need to engage with a complete new framework in education based on a vision not tied to our past. Look forward to the continued dialogue on your blog. Thanks for your valuable comments. While I agree that the current structure of schooling is based on an old industrial model, out of sync with today’s world, we must accept that we have to work with the current structure and organization we have, unless one is in the business of creating a new school from scratch. Furthermore, there are a number of aspects of the current school model which I believe will remain relevant and important to students, such as values education. I envision an organic process of change in which all members of the school community play a role. As we identify areas that require change, whether it be the daily schedule, grading and assessment or project based learning, different constituents (teachers, students and parents) must be involved the change process. The strategic plan is the road map we create to help us over time to navigate closer to the aspirations stated in our mission/vision. Michael Fullen, who writes extensively on school change, points out that “change is a process, not an event.” (The New Meaning of Educational Change, 2001). Organizational change experts from Fullan to Senge have convincingly made the point that meaningful, deep, lasting organizational change requires an inclusive process. In essence, the process referred to by Fullan, is to create an environment where schools build the capacity to change. This requires that all stakeholders clearly understanding the current reality as well as the values, purpose and vision expressed in the mission. Understanding and working from the current situation and structure as it stands, we can then work collectively towards lasting, meaningful change.